Wetsuits. Have any group of divers together for a chat, and the topic eventually comes up. Colour, thickness, style, open cell, smoothskin or nylon. The options are numerous and often leave a diver faced with far too many choices for a single afternoon. Your wetsuit is your warmth, comfort and protection, and one of the determining factors in the difference between a great dive and one you would rather forget. Neoprene is a synthetic rubber, invented in France in the 1930’s. On its own, it is a plain, rubber like material, similar to an eraser. For use in the wetsuit industry, the rubber compound is mixed with Nitrogen gas to create a foamed rubber substance. This produces tiny separated bubbles within the foam rubber, which create the insulating effect and buoyancy of the fabric. Once the foam is sliced into the correct thickness, a layer of nylon is laminated onto one or both sides to give the Neoprene fabric a colour or specific texture. This forms the Neoprene fabric used in the manufacture of wetsuits. 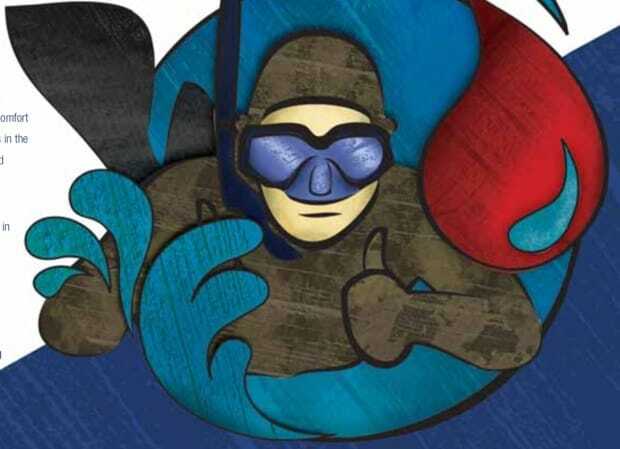 Selecting the correct type of wetsuit is one of the key gear decisions for any diver. It is therefore important to ensure you have made the right choice. Depending on your location, water temperature and type of diving, there are a number of options to consider. The most versatile type of wetsuit for spearfishing is the 2 piece, otherwise known as a Farmer Jon and Hooded Jacket. This style of suit allows for maximum warmth, comfort and flexibility, without the need for zips and fastening systems found in traditional one piece style suits. One piece suits with a back zip, are generally used for surfing, but are also commonly worn by scuba divers. Any zipped area of a wetsuit creates an entry point for water and quality suits will therefore have a zip flap or water seal layer of Neoprene to minimise any water flow. The area of the suit surrounding a zip, will be unable to stretch to its fullest, due to the inflexibility of the zip. This is especially important from a free diving perspective, as entry zips are generally located on the upper body and may inhibit the stretch of the suit across the chest. The Farmer Jon is shaped like a vest on top, and covers the legs and upper body, whilst leaving the arms exposed. An alternative to the full Farmer Jon is high waist pants which end halfway up the midriff. This is purely a personal choice, but has the advantage of being removable without flexible the need of removing the Jacket first. The Hooded Jacket is worn over the Farmer Jon, which creates a double layer over the torso to maximise heat retention, and fastens between the legs with a beaver tail. The double layer effect allows for a thinner suit to be worn, which then requires less weight to overcome buoyancy. The Jacket will often encompass a loading pad on the chest area to provide a degree of padding whilst loading a speargun. A further addition to the spearfishing wetsuit is protective panels around the knee, elbow and buttock areas of the suit. New developments in abrasion resistant fabrics allow for increased protection of these well worn areas without affecting the comfort and flexibility of the suit. 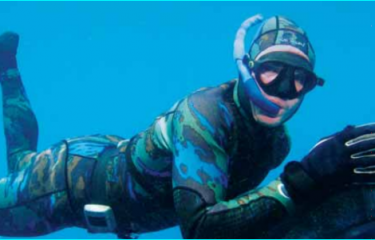 In selecting the correct spearfishing suit, fabric type and thickness are the 2 major considerations. A multitude of fabric types are now available, with the most common types being divided into the double nylon and open cell distinctions. Double nylon is as the name implies, and has a layer of nylon laminated to either side of the Neoprene rubber. The nylon layer gives the fabric a colour and also protects the delicate Neoprene rubber beneath. The nylon outer also provides a fi rm base for stitching, as it allows the thread to hook tightly without ripping through the underlying rubber. Double nylon suits tend to be more popular due to their strength and durability, and ease of donning. Because the inside of the fabric also incorporates a nylon layer, putting the suit on and removing it is an easier process as no lubrication is required as with open cell suits. Open cell wetsuits utilise fabric that has no nylon layer on the second side of the rubber and this creates the effect of a suction seal against the skin. 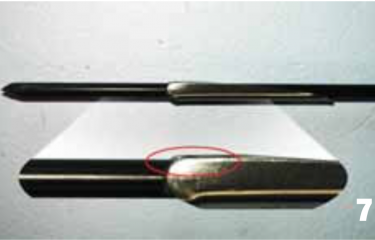 The Nitrogen foamed rubber is sliced into sheets at a point exposing the bubbles. This creates tiny suctions that adhere to the skin and create a fi t which drastically reduces water flow through the suit. Open cell suits feel warmer due to the fact that they allow less water flush, rather than the fabric itself having a greater insulating effect. Open cell Neoprene however, has its drawbacks and tends to require a little more care than double nylon when putting on. The seams are sewn on the outside of the suit only, as there is no nylon layer on the inside for the thread to hook into. Due to the suction effect of the open cell side, a lubricating agent must be used to don the suit. Many divers use their own combinations of lubricant, however hair conditioner mixed with water works extremely well and tends to cause less irritation to the skin than soap or shampoo. Technology in fabric development has resulted in a new generation of high stretch Neoprene material available for the manufacture of wetsuits. High stretch fabrics now offer up to a 30% increased stretch rate compared to those available previously. This drastically improves the fi t and comfort of new generation suits and offers increased flexibility and range of movement. In accordance with higher stretch rates of fabric, the wetsuit compression on a diver’s chest is reduced, allowing him greater chest expansion for deeper and longer dives. High performance spearfishing suits now incorporate digitally designed camouflage patterns, flexible, abrasion resistant materials and anatomical cuts to give the most demanding diver the edge in the oceans unforgiving environment. When selecting your new suit, the fit is always of paramount importance. An ill fitting suit, either too big or too small will negatively impact the spearfisherman’s comfort and therefore reduce his ability to dive at peak efficiency with maximum breath hold. Thicker is not necessarily better and a poor fitting 5mm suit will be far less efficient than a correctly sized 3mm one. Digitally enhanced pattern design, combined with high stretch fabrics have increased the size range available in off the peg suits to accommodate most body types and more options are now available to divers. This combined with tailoring services at your local wetsuit retailer should allow for a perfect fit. 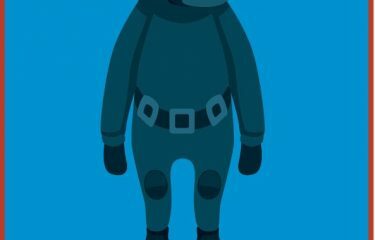 A common misconception amongst divers is that a wetsuit is a wetsuit. There are many different types of suits and each is intended for use in a different manner. A surfing suit is extremely flexible and offers a high degree of movement. It is however designed to be used on the surface of the water and would not last long as a dive suit. Lightweight flexible fabrics are prone to greater compression over time and will begin to deteriorate rapidly when constantly exposed to the pressures of deeper water. Dive suits are constructed from materials that are less prone to compression and are designed to withstand the rigours of diving, rather than surface use. All suits do compress over time, and it will be noticed that fabrics will begin to loose their stretch rate eventually. High performance suits are expected to have a limited life span, and it is not uncommon to replace a suit after a season of tough diving. Whatever your choice of wetsuit, one of the golden rules is to take care of it as you would any other piece of gear. For some reason many divers seem to place the least amount of importance on caring for their suits, leaving it as almost an afterthought. Rinsing in fresh water after a day’s diving is paramount. A good soaking is best. Hang it up to dry in a shady spot rather than the blazing sun and avoid placing your suit in the dishwasher, washing machine or tumble drier. Most detergents will work on wetsuits, however stay away from bleaches or abrasive cleaners. If it really needs a good clean, let it soak in a small amount of fabric softener. Just remember to rinse it well afterwards. Your wetsuit is your armour in the sea. Treat it well and it will return the service. Check it periodically for nicks and cuts and loose threads and send it in to your local wetsuit retailer for a service when needed. A good days diving is often dependant upon the condition of your kit, and having the correct wetsuit will help you dive longer and deeper with a greater degree of comfort. When next purchasing a wetsuit, take some time to make the right choices. Ensure the suit will be right for your conditions and areas of diving, and that you are comfortable in it. Look after your suit, and it will look after you.